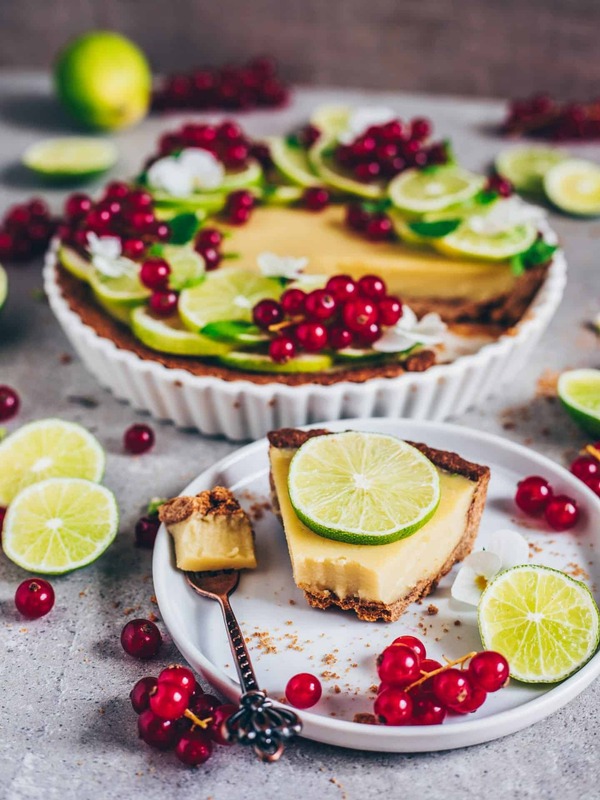 This vegan Key Lime Pie is delicious, gluten-free and refined sugar-free. It makes a perfect delightful dessert that is healthy, refreshing and easy to make. I created this recipe very spontaneously because I just wanted to try out my new blender. 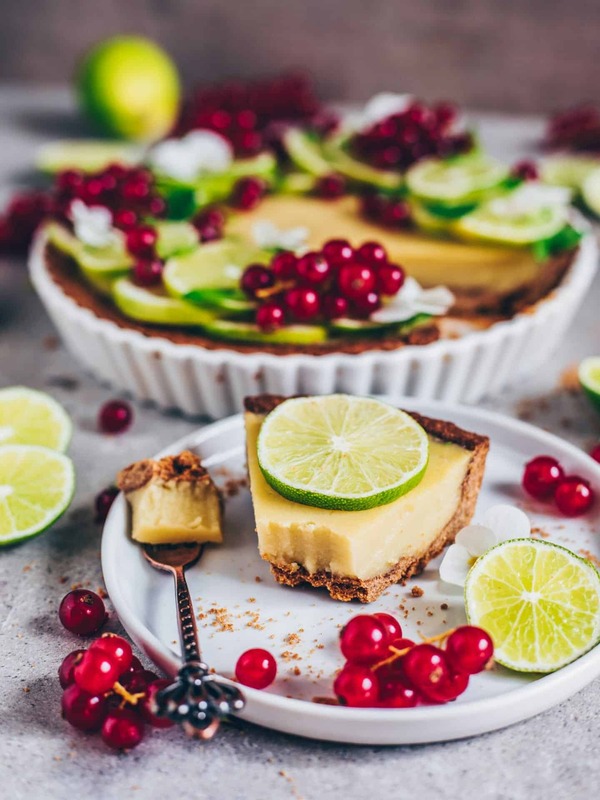 But then I was so happy with the texture and taste of my Vegan Key Lime Pie, so I decided to share this recipe with you! Not only it is totally delicious, but it is also super easy to make and you need just a few simple ingredients. 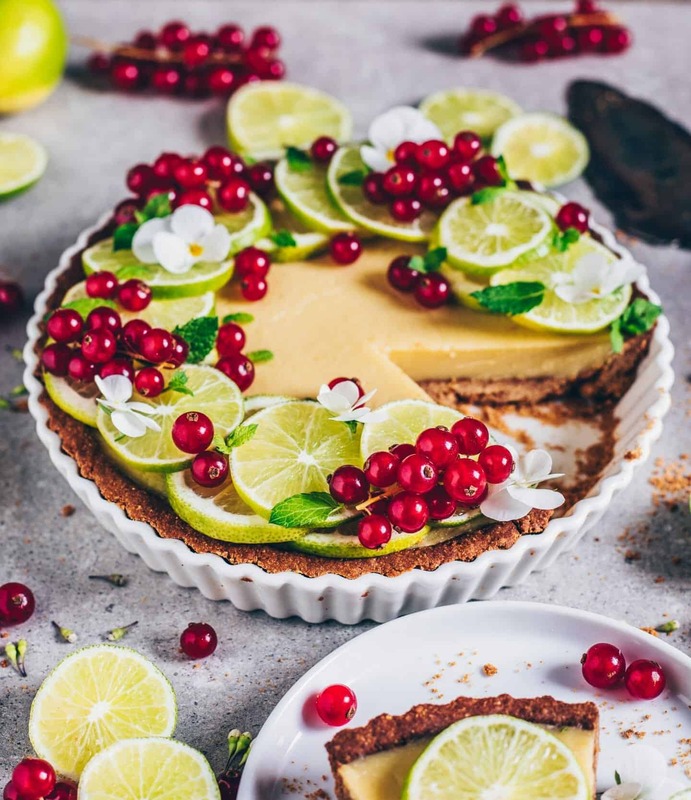 I was so satisfied with the result because it has a creamy filling and features a crunchy “buttery” crust made of almonds and gluten-free oats. Another great thing about this recipe is you do not have to bake the pie filling. So if you prepare the pie crust before, you do not need to heating your oven up. I mean, how amazing is that?! 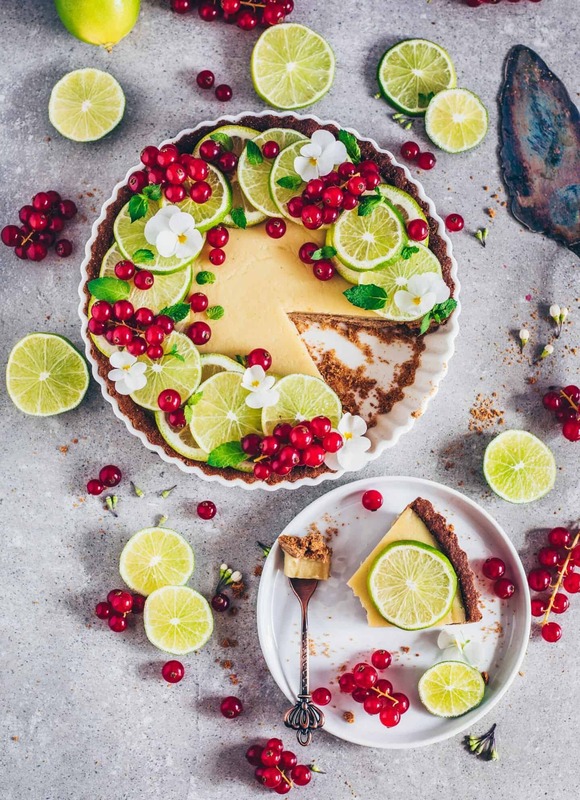 As mentioned before this Vegan Key Lime Pie is just made with plant-based, wholesome and healthy ingredients. 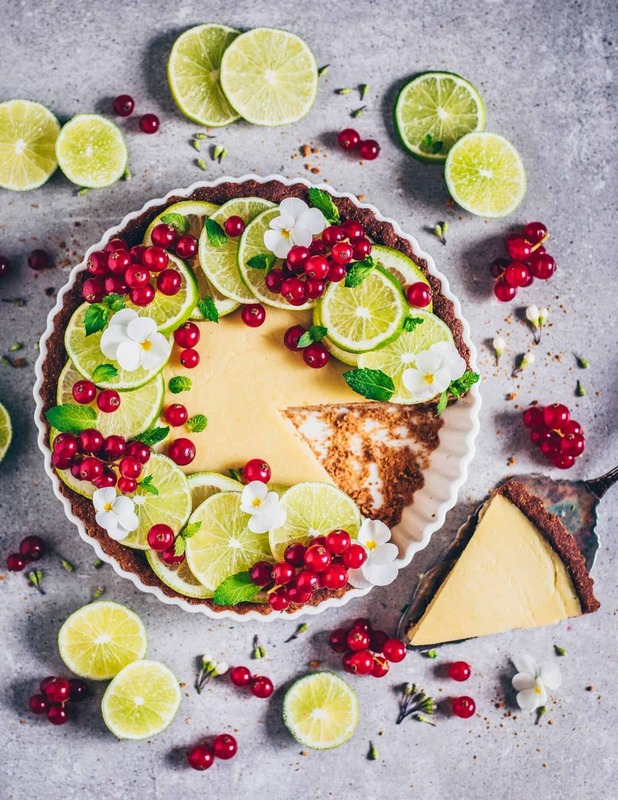 It has a creamy coconut lime filling with a crispy almond oat crust! You need NO TOFU and NO CASHEWS and only 20-MINUTES baking time. The crust is made out of gluten-free oats and almonds, that give a delicious nutty flavour. As added extra bonus almonds are also high in protein! If you do not want to use almonds, you can sub regular (gluten-free) flour of choice. To get the dough to stick together, I use a mix of coconut oil and agave syrup. Sticky syrup is absolutely perfect for binding and much healthier as refined sugar. But now let’s start with the recipe. 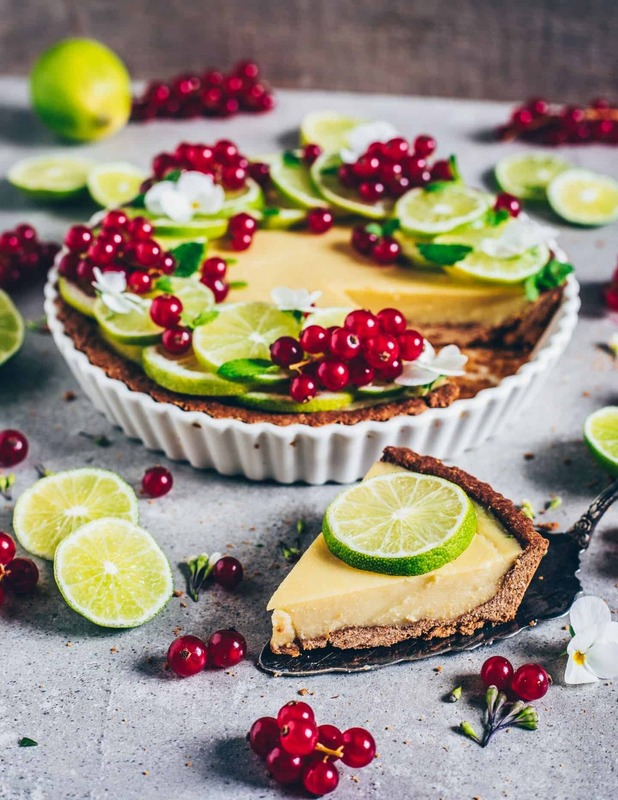 You can also make this Vegan Key Lime Pie into Mini Tarts if you prefer! Preheat the oven to 180℃ (355℉). 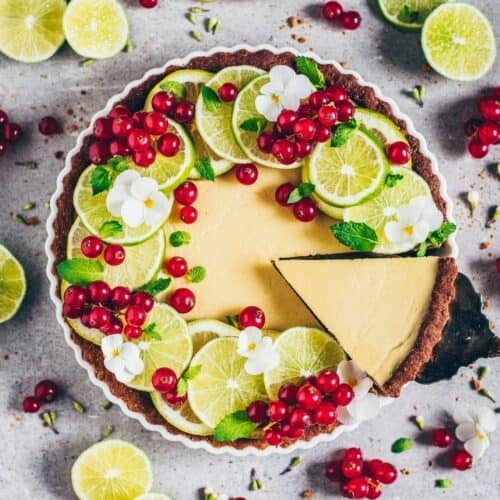 Grease a 8-inch tart tin (20 cm) with coconut oil. In a blender or food processor, add oats and almonds. Process until finely ground. Add coconut oil, agave syrup and a pinch of salt. Mix until just combined to form a ball. (If it is still too crumbly, add a bit more oil/ agave syrup). Press down the mixture into the button and sides of your greased tart tin with your fingers. Bake for 20 minutes, or until golden-brown. Let the tart cool completely afterwards. Heat up coconut milk in a saucepan. In a cup, add lime juice and cornstarch. Mix until dissolved. Next add it to the hot coconut milk along with agar-agar, rice syrup, vanilla (and matcha if desired). Stir the mixture constantly until it begins to cook and thicken. Keep stirring and cook for approx. 1 minute more. Then Remove from the heat and set aside. Allow to cool down until room temperature. 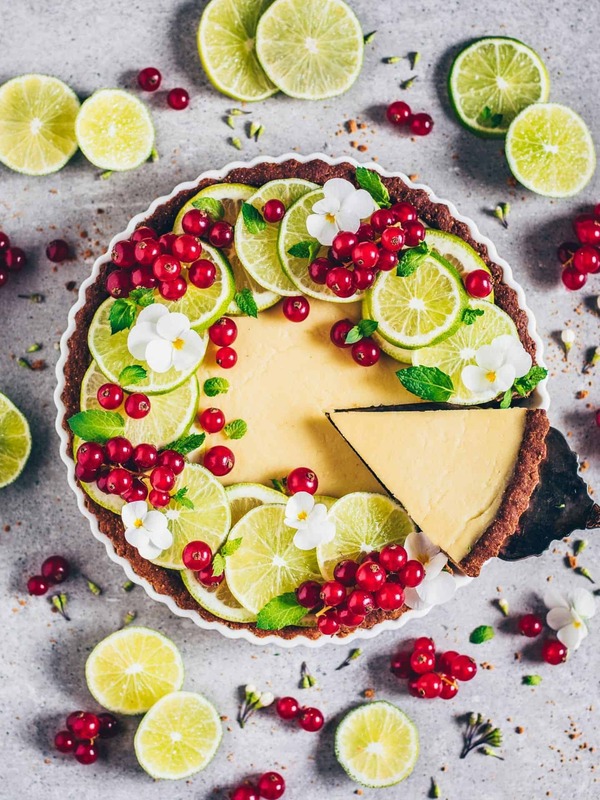 Pour the key lime filling into your prepared tart. Let set in the fridge for at least 3 hours (or overnight) to firm up. 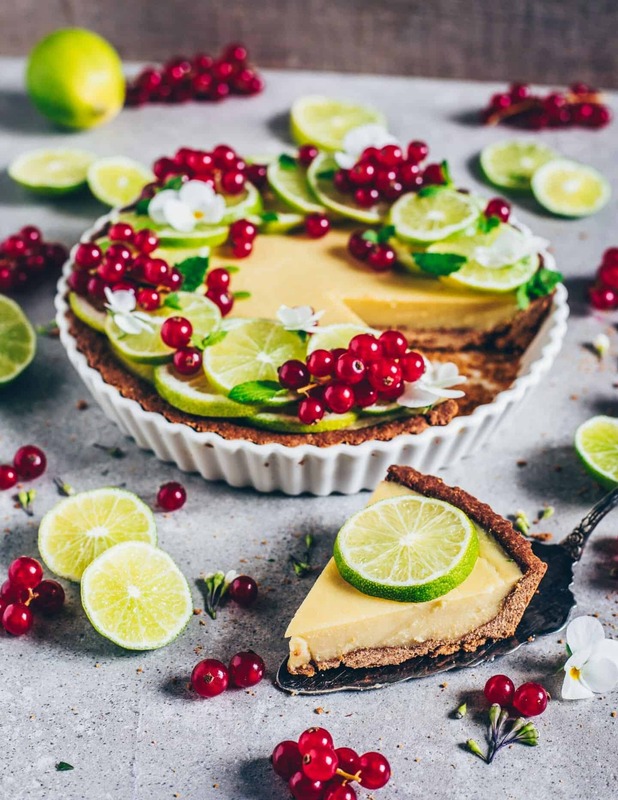 Decorate your tart with lime or lemon slices and red currants or other fruits/ berries before serving, if you like. You can store this Pie in the fridge for up to 1 week. Please do not freeze it because it will alter the texture into spongy. You can vary the recipe by using any other fruit juice you like instead of lime juice. Of course you can use homemade coconut milk. But please make sure that it’s full-fat. Otherwise the texture won’t be so creamy and firm. Easy to make and super delicious! Also my flatmates love it!